Nine books translated into French and success also with the Man Asia prize in 2009 for ” The Bank of the River” (1) (previously translated into English as “The Boat to Redemption”).The many talents of the author are also shown with “On a Bicycle” (2), a collection of short stories published a few months ago. The English translation of the novel’s title focuses on redemption. The narrator’s father, the son of a martyr of the Revolution, sees its parentage questioned by a investigation commitee. He loses his official position, his wife files for divorce; he takes refuge on a boat, a small barge, providing transport, in convoy, on the river of the “Golden Swallow”. He lived for eleven years on boat No. 7 with his son Dongliang, the narrator, who chose to follow him. Redemption for the father who wants to make up for his infidelities and will go as far as a self-castration while requesting a review of the findings of the investigation committee. The title can be translated as “Bank”, because everything stands in the way between the world of boats, often populated by marginals, and the people living on the banks, people responsible and politically reliable, party bureaucrats, arrogant, brutal and corrupt. The arrival on the boat of a little girl, an orphan, Huixian, creates many difficulties but after a few years, the awakening of romantic feelings in Dongxian. He is isolated, as Huixian he does not belong to any of these two worlds; he is rootless and his occasional relations with his mother are as unpleasant as the constant supervision of his father who seems only preoccupied with the sexuality of his son. Huixian took part in a parade and her beauty made her famous, she joined the opera of the district and later on the propaganda company. She spends her time in the offices of the municipality with the officials and stops school. When she is no longer protected by higher officials,her “artistic” career comes to an end with a job in the shop of a hairdresser. The construction of the book is sometimes weak and all the episodes of Huixian’s life, after she left the boat, do not always fit easily into the story. The portrait of the father is quite schematic, particularly in his relations with Dongxian while the character of the mother, an actress in a troop of propaganda and local radio entertainer, is much more elaborate. The secondary characters are full of life, which is rare in books by Su Tong and contribute much to the interest of the novel. It is a book longer, more complex, more ambitious than previous novels. Su Tong was born a few years before the start of the Cultural Revolution; very strong childhood memories are the source of the book. The author carefully avoids all value judgments, and the historical episodes are completely absent; the death of Mao Zedong is not even mentioned. This is the life of ordinary people during this exceptional period with its slogans, its political control, its brutality and abuse. Politics is how to benefit from the exercise of power and everyone is trying to get some crumbs. The truth, which truth … several characters are successively described as sons of the martyr on the basis of political power relations. We sometimes regret that Su Tong has not the qualities of humor of a Mo Yan, but we should not spoil our pleasure, this book is quite a success. “On a Bicycle” is a collection of thirty short texts, of good quality; the translation of which by Anne-Laure Fournier reads nicely. Many autobiographical details about his childhood, his village and the canals of Suzhou. A poor family (“apart from their four children, my parents had absolutely nothing”) but this does not affect the optimism of the author. We are pleased to read more than a dozen very short stories, full of rhythm, with characters that we can remember especially the unexpected endings: an old gourmand eats his savings, a beaten woman is cooking a feast, a miserable neighbor to whom fish heads are given regularly, eventually opens a restaurant and offers them successfully. Stories of shops: silk, ravioli, the tinsmith, the hairdresser, the butcher, a tea house, the pharmacy with a dumb employee who, despised, saves a client. Recent stories of his adult life are less interesting and his relationships with his readers are treated superficially; but his comments on the authors he loves like Salinger, Borges, Carson Mc Cullers and ” The ballad of the sad cafe “are endearing. Su Tong was born in 1963 in Suzhou, one of the cultural capitals of China. A family of four children with a father as an executive and a mother as a worker who have no connections with the literary and artistic circles of the city. He studied Chinese literature at Beijing Normal University and after a short period as a teacher in college, became the editor of the journal “Purple Mountain”. With his short stories, he becomes known as a representative with Yu Hua of ” the avant-garde”. The international recognition came in 1990 with “Wives and Concubines” and especially with the film by Zhang Yimou. 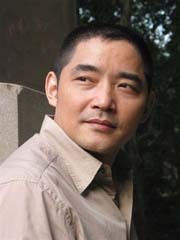 He writes novels that depict different periods: the emperors of China (” Binu and the Great Wall”, a book to forget, ” My life as Emperor “, a superb fiction), the end of the Empire (” Wives and Concubines”), the beginnings of Maoism (“Made up Face” and “The House of Poppies”), the period of the war with Japan (“Rice”). With Su Tong, the political phenomenon is very marginal; however, family conflict, the extreme hardness of human relationships and his interest in the sexuality of the characters have been able to attract some criticism. (1) ” The Bank of the River”, translated by Francois Sastourné. 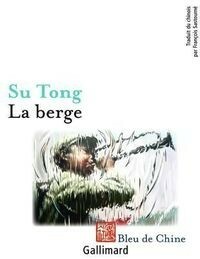 Bleu de Chine-Gallimard. January 2012, 465 pp, 28.50 euros. 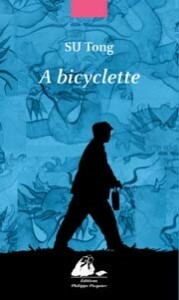 (2) ” On a Bicycle”, translated by Anne-Laure Fournier. Editions Philippe Picquier. 2011, 140 pp., 15 euros.